Which Kitchen Worktops To Choose?, Corian? Granite? Neolith? Choosing Kitchen worktops can be a minefield of too many choices. Our Clients often ask what is the best choice of work surface in a kitchen?. The easiest answer to this is divided between a client’s personal Preference to colour & style, Usage, Design & Budget. However each work surface does carry its own pros and cons. Highlighted below are a few of the more popular surfaces available, to help you in making the right purchase. Granite has probably been the most common material when people talk about Kitchen worktops. Positives, Granite is an extremely hard wearing material formed over millions of years under extreme pressure. As such it is a wide varying and beautiful material, which dependant on the variation can have many natural features. Negatives, Granite can be a porous material, (some more than others). Granite can be sealed to limit its porous nature & helps to prevent staining. Pictured Below is a Recent Contemporary English Classic Kitchen. 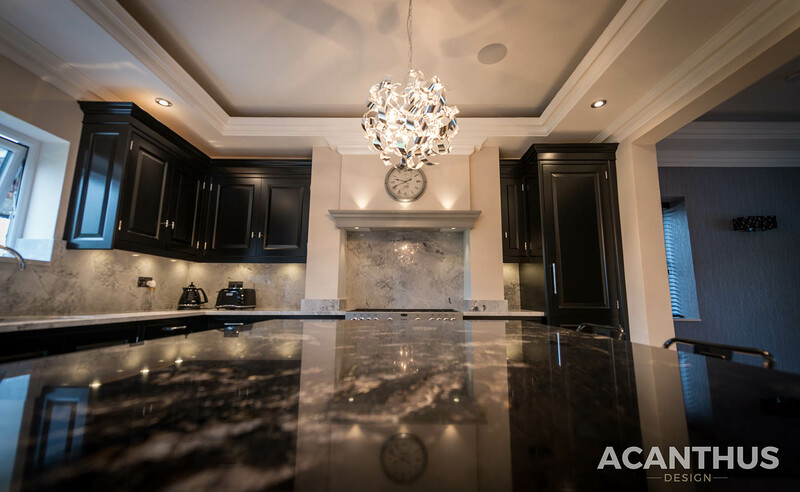 Featuring two variations of Granite, Cosmic black & the complimentary stone being Super white, (actually more of a grey) but we felt the two materials complimented each other perfectly when designing this Kitchen. Quartz is quickly becoming the most commonly used work surface throughout the industry. A man made material made from combining granite’s and quartz crystals, mirror chips and resins. Quartz does actually fall into lots of brands, Silestone, Ceasarstone, Polarstone & Decton. Branded as almost unique products but all share similar qualities in their production. Positives, Quartz like granite is a hard wearing material ideal for Kitchen Worktops. However unlike natural stone Quartz is non porous due to the introduction of the resin during the manufacturing. It is also mould, mildew and heat resistant for the same reasons. Negatives, The biggest downfall of Quartz is you just don’t get the effect of it being a natural material. There are brands such as Polarstone are producing surfaces that mimic a natural stone (which they are doing quite well). Quartz still does not have the edge if you like that natural beauty found in Granite. Pictured Below is a project where the client wanted a flat even colour which would not distract from the kitchen. For him Silestone Gris Expo did just that, quite a subtle and understating look. Although I’m labelling as Corian, this surface is actually a composite & Corian is the leading brand. Corian is made up of various resins, fillers and pigments (Basically plastics). Predominately used in a lot of dental surgeries and any of your local fast food takeaways. However this material does have a lot going for it when we think about kitchen Worktops. Positives, Corian is a very versatile material, it can be produced as one seamless top by bonding together individual tops & sanding them in position. 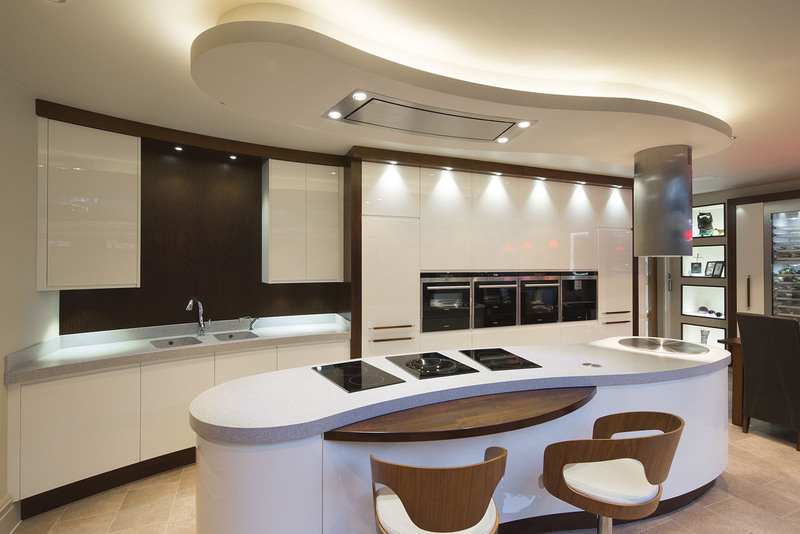 Corian can be heated & Shaped, so when we think of curves we have to consider Corian. Negatives, for as many positives Corian has there are just as many negatives, cost wise it can be more expensive than Granite and Quartz, it can scratch quite easily and for the overall look it can seem a bland option for a kitchen. Looking at the negatives you wouldn’t use Corian, however when you see what Corian can do you can almost forgive its negatives and just admire what is possible. Pictured below is an Acanthus Milano Kitchen Featuring Corian Kitchen Worktops. Neolith is a porcelain material that comes in a thickness of 4 or 6mm, it is then mitred up to form a thicker top with the use of packers. As a material porcelain is extremely touch material. To the point of being virtually scratch resistant. Positives, has to be its toughness, no other material is as scratch resistant as or as tough as Neolith. From initial testing it is virtually indestructible. Neolith can also be used as wall panelling, door panels & flooring, so its versatility has to be a plus point. 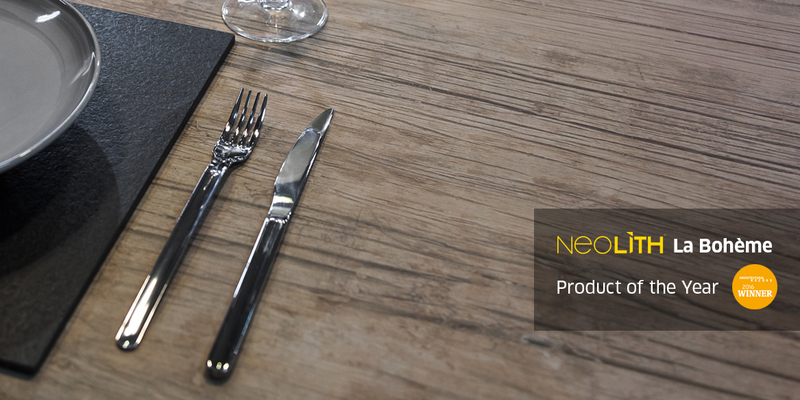 Negatives, Neolith is one of the most expensive worktop materials available making it a negative for many people. It also lacks the feel of both Granite and Quartz. For the right client with the right design this material can look amazing, very modern and even leaning towards industrial. 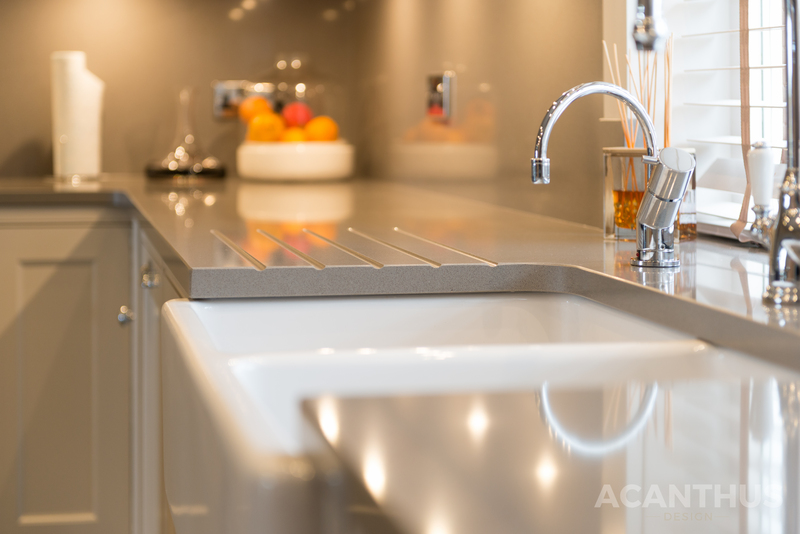 Your work surface is often a reflection of your design and your personal taste. Whether it is natural beauty, sleek even tones, quirky curves or ultra-modernist industrial. None of the above are ever a wrong decision & that is the reason we use all of them for individual merits. Thanks for taking the time to read this short insight to types of worktops available & that it may help you in making the right selection for your next project.